Going into the 1989 season, Orlando manager Ron Gardenhire liked what he saw in young Mike Randle, according to The Orlando Sentinel. Randle impressed Gardenhire enough to start the year as the team's leadoff guy, The Sentinel wrote. "Mike hits a bit differently than the textbook might dictate, but our batting instructors don't want to touch him," Gardenhire told The Sentinel. "He keeps getting a couple of hits every day. When the Orlando fans see him play, they'll remember him." Randle ended up hitting .250 that year for AA Orlando, stealing 21 bases. Randle got just one more season as a pro. He never made it higher than AA. 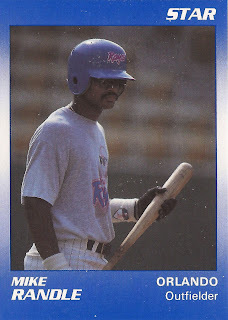 Randle's professional career began in 1986, taken by the Twins in the sixth round, out of San Jacinto College in Texas. With the Twins, Randle started at rookie Elizabethton. The outfielder got into 58 games and hit .299. He also stole 19 bases. For 1987, Randle moved to single-A Kenosha, stealing 45 bases over 139 games. He also hit .294. He played 1988 at single-A Visalia, then moved to AA Orlando for 1989. At Orlando, Randle went 3 for 6 in a July game, knocking in two. That same month, he went 6 for 7 in a 18-7 win, tying a league record. Randle came back for just one more season, playing 1990 back at Orlando. In 102 games, Randle hit .234. He also stole just 16 bases, ending his career.